Your smile is one of the greatest assets that you possess. With recent advances in technology there are a wide range of options to improve your smile. Cosmetic treatments can range from simply whitening teeth to advanced treatments such as orthodontic treatment to straighten crooked teeth. 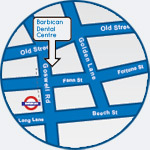 At Barbican Dental Centre we aim to use minimally invasive techniques to help you achieve a great smile. We place high importance on maintaining the health of your teeth aim to improve your smile without risking the health of your teeth. You are unhappy with the appearance of your teeth and smile? Have always wanted to improve the look of your teeth but unsure how? Have any silver fillings you don’t like the look of? Have teeth that are stained or discoloured? If you are conscious of your smile when having a photo taken? There are a number of ways in which you can improve smile. From simple treatments such as hygienist visits, tooth whitening, white fillings through to more comprehensive treatments including orthodontics, veneers and crowns.